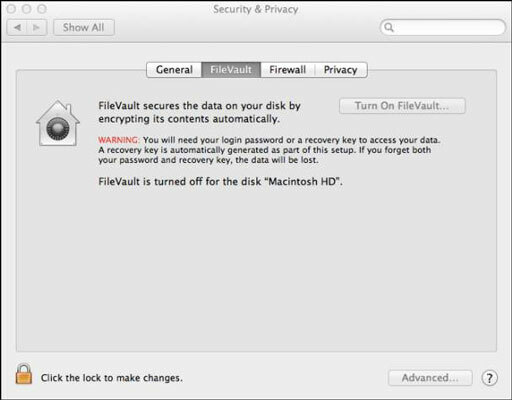 If your computer houses truly hush-hush information such as your financial records, you can scramble, or encrypt, the data in your Home folder (and only your Home folder) using an OS X feature known as FileVault. 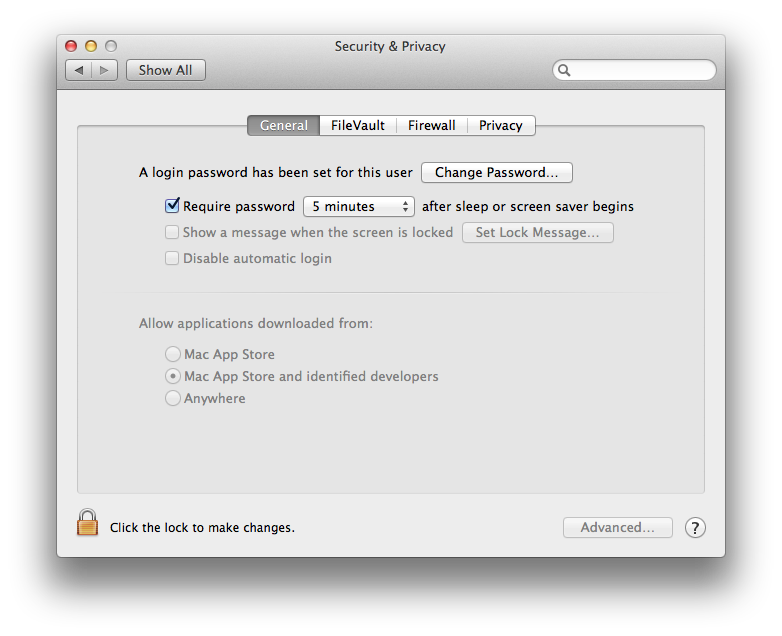 Choose Security & Privacy under System Preferences and select the FileVault tab. Each user must enter their password. Apple automatically generates a recovery key you can use to unlock the vault. You can store this key with Apple, which will ask you to answer security questions (for example, What street did you live on when you were 9 years old?) to verify your identity. A keychain can store passwords for programs, e-mail accounts, websites, and more. You can create keychains for different purposes (one for online shopping, say) by opening Keychain Access in the Utilities folder under Applications. Your keychain password is initially the same as your login password, and for many users, that’s the way it’ll stay. 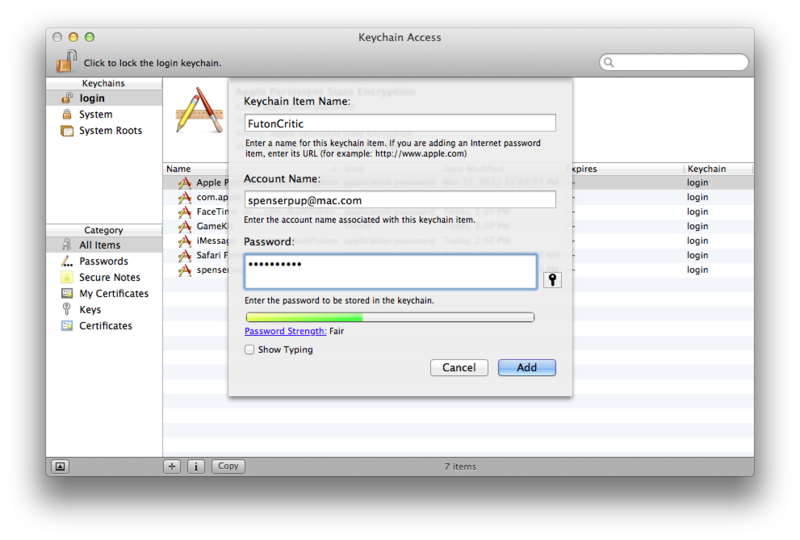 To add keychain passwords, choose File→New Password Item. Fill in the account name, keychain item, and password. Apple will let you know whether you’ve chosen a wimpy password or one that is bulletproof. If you ever forget any of the passwords you’ve used on your Mac (including web passwords), open Keychain Access and click either All Items or Passwords from the pane on the lower left. In the right pane, double-click the item that has the password you want to recover. If you work in an office or other environment where anyone can peek at the monitor to see what you’ve been up to, log out of your account when you’re finished doing what you’re doing. But if you’d rather not bother logging out or you don’t think you’ll remember to do so, go to the Security & Privacy pane of System Preferences, click General, and select the Require Password after Sleep or the Screen Saver Begins option. You get to choose a timeframe (immediately, 5 seconds, 1 minute, 5 minutes, 15 minutes, 1 hour, or 4 hours). You can also select the Log Out after x Minutes of Inactivity option by clicking the Advanced button at the lower-right corner of the window. Some software that you run on your Mac benefits from knowing where your computer is located. Still, if this wigs you out, deselect the Enable Location Services check box under the Privacy tab in Security & Privacy Settings. 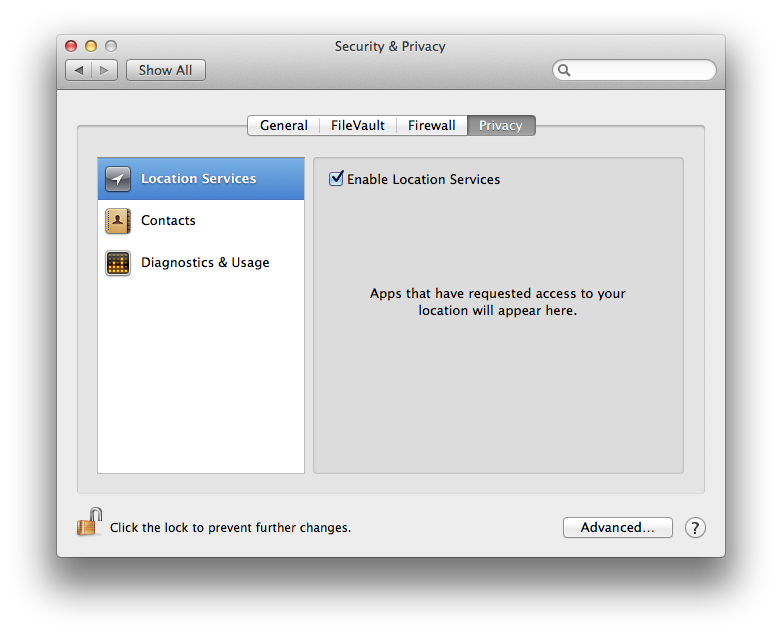 Apps that want to use your Mac’s location are also listed, so deselect any of the programs that could theoretically benefit from knowing your whereabouts that make you feel uncomfortable. 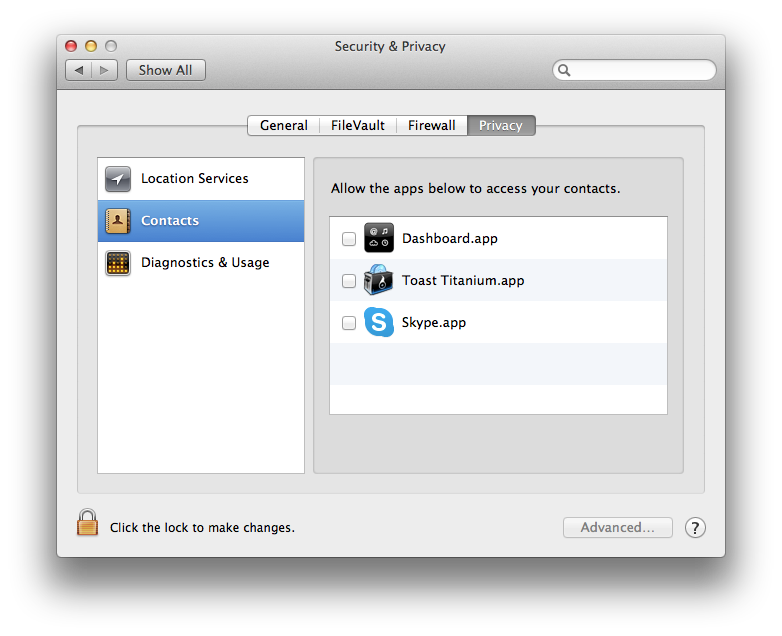 To secure the data associated with apps like Contacts, click the Privacy tab in Security & Privacy Preferences. Check out an app or tool in the left pane, such as Contacts, then look to the right to see the apps that want to use the Contacts data, such as iBooks Author, Google Chrome, and Skype. You can give permission to such apps by placing a check mark next to their name. Remove the check mark if you have a problem with those apps utilizing Contacts. Repeat this process with other apps or tools.